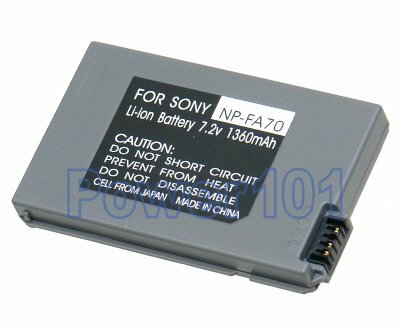 NP-FA70 is the large battery in the FA series: FA50 and FA70. FA70 is highly recommended over FA50. It is not much larger, still looks aestetically pleasing in the camcorder and will last up to 4 hours. These batteries fully support the INFO technology Sony relies on to display the battery usage. 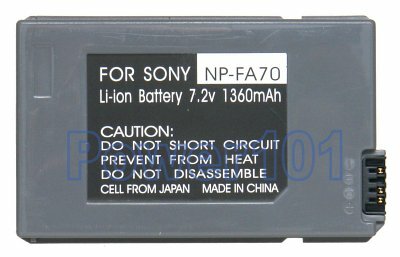 These batteries are compatible with Sony DCR-DVD7, DCR-HC90, DCR-HC90E, DCR-PC1000, DCR-PC1000E, DCR-PC53, DCR-PC53E, DCR-PC55, and DCR-PC55E. If your camcorder is not listed, please check our camcorder battery finder. These batteries can be charged by any standard charger compatible with FA-series FA50 or FA70 batteries, plus they can be charged directly on the camcorder.